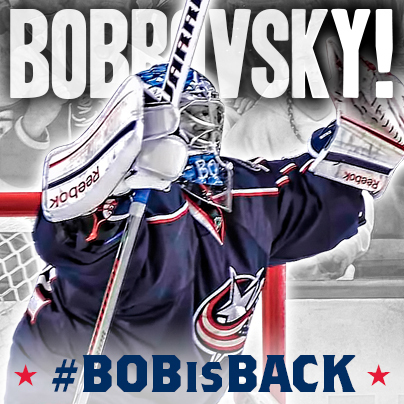 COLUMBUS, OHIO – The Columbus Blue Jackets have re-signed goaltender Sergei Bobrovsky to a two-year contract extension through the 2014-15 National Hockey League season, club General Manager Jarmo Kekalainen announced today. As is club policy, terms were not disclosed. “Re-signing Sergei Bobrovsky was a top priority for our organization and once again ownership has given us the resources to build a winning team. Bob is a terrific player and an outstanding young man with a work ethic that is second to none and was a well-deserved winner of the Vezina Trophy this season as the NHL’s top goaltender,” said Kekalainen. “He was a big part of the progress we made last season and we expect him to play an important role in the growth of our team. Bobrovsky, 24, captured the 2012-13 Vezina Trophy as the NHL’s top goaltender after posting a 21-11-6 record, 2.00 goals-against average, .932 save percentage and four shutouts in 38 appearances for the Blue Jackets. Among goaltenders that played 25 or more games, he ranked first in save percentage, second in goals-against average and sixth (tied) in wins and shutouts. He surrendered two goals or less in 26-of-38 games, including 10 outings in which he allowed one goal. He made 30 or more saves 16 times, including a season-high 39 on four occasions. From March 1 through the end of the season, he posted an 18-5-3 record with a 1.60 goals-against average, .946 save percentage and four shutouts in 26 games. Bobrovsky was named one of the NHL’s Three Stars of the Week on three occasions during the 2012-13 season. He was named First Star for the weeks ending April 14 (3-0-0, 0.97 GAA, .971 SV% in 3 GP) and March 10 (4-0-0, 0.77 GAA, .972 SV% in 4 GP) and Third Star for the week ending March 17 (1-0-2, 0.62 GAA, .982 SV% in 3 GP). He was also named Third Star of the Month for March (9-2-3, 1.49 GAA, .950 SV%, 3 SO in 14 GP). A native of Novokuznetsk, Russia, he was acquired by the Blue Jackets from the Philadelphia Flyers in exchange for second and fourth round picks in the 2012 NHL Draft and a fourth round pick in the 2013 NHL Draft on June 22, 2012. He has gone 63-34-16 with a 2.49 goals-against average, .917 save percentage and four shutouts in 121 career NHL games with the Blue Jackets and Flyers. Signed as an undrafted free agent, Bobrovsky went 28-13-8 with a 2.59 goals-against average and .915 save percentage in 54 games as a rookie in 2010-11. Online Form - July 1, 2013 ETW - Bob is Back!